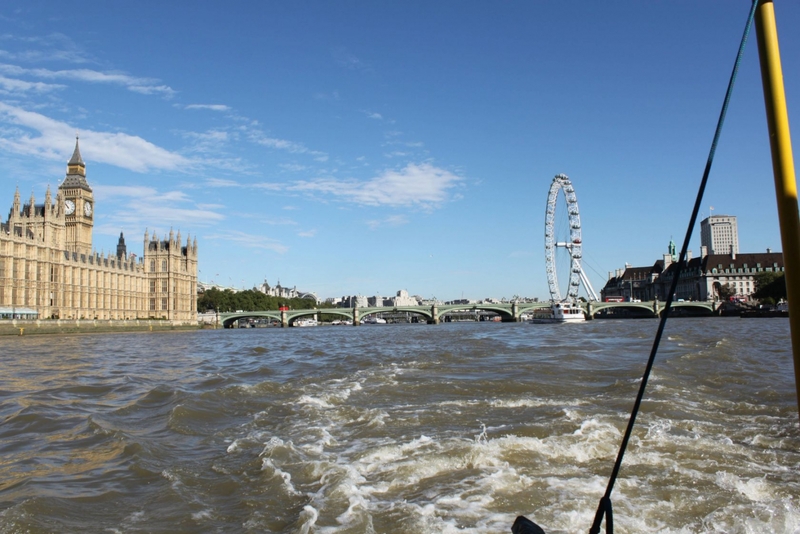 London is definitely best viewed from the river via amphibious war machine or otherwise. I’ve taken plenty of tours in my life but, if I can help it, I steer clear of them preferring instead to explore new places on my own. I’ve been unfortunate enough to find myself stuck with rambling, white-haired old grannies who wouldn’t stop talking if someone came up and ball-gagged them more times than I can count. For me, a tour is best presented with minimal walking and maximum sitting; there’s nothing like being chauffeur-driven and, if you want to listen to the tour guide, you can. Otherwise sit back and enjoy the sights for yourself. 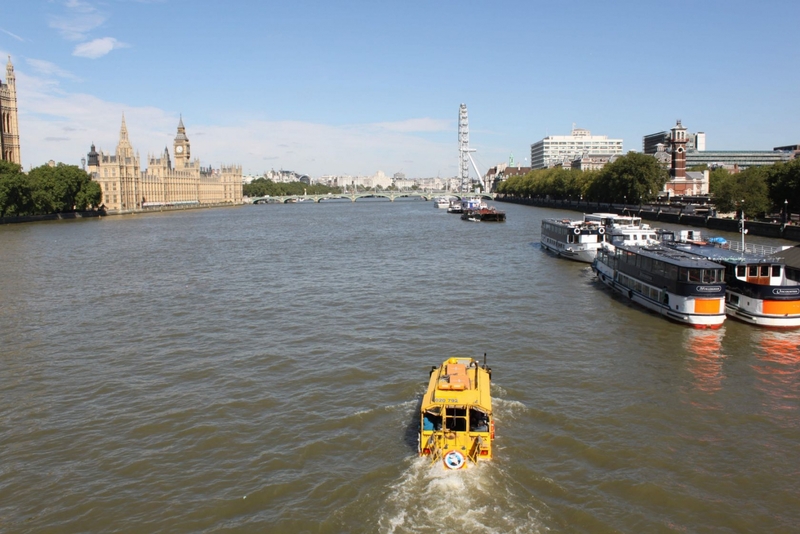 The London Duck Tour, easily one of the better tours in London and definitely one of the fun things to do here, provided exactly that. 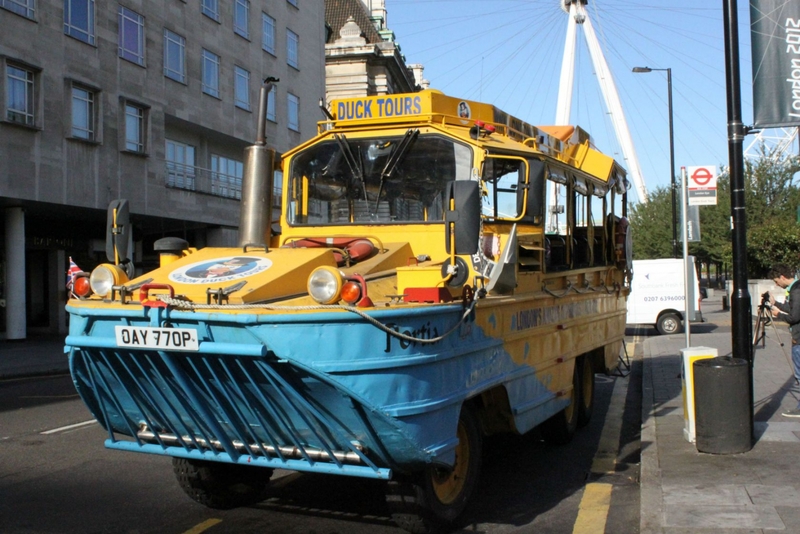 But what on earth is a London duck tour? I wondered when I first came across the idea. Contrary to my initial reaction, you’re not taken for a walk down the Thames looking for mallards, nor do you climb aboard a duck-shaped pedalo and trundle downriver. I actually found myself inside a former WWII supply vehicle – one of nine in the whole fleet. Portia, her name was – a Shakespearean heroin from The Merchant of Venice. 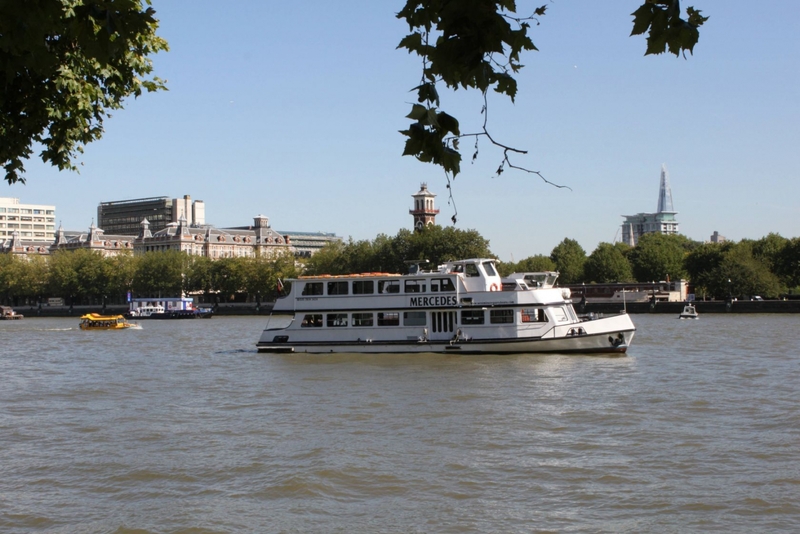 Capable of taking on the clogged London roads and its choppy, gravy coloured Thames, Portia and the rest of her family weigh a hefty nine tonnes each and clock up a blistering six knots. They were heavily utilised in the D-Day landings but now, with their yellow and blue paint jobs, carry up to thirty passengers at a time all around London. Having booked the tour A) midweek and B) in the morning, I was in a group of only about ten others, allowing for a more personable reception from Matt, our London tour guide. I settled at the back of the vehicle and listened to the engine rumble to life. With the swiftness and grace of a wounded rhinoceros, Portia lurched down the road. The London Eye watched us go as we set off in search of some classic London landmarks. Chugging across Westminster Bridge we were absorbed in the chaotic roads near the Houses of Parliament, Big Ben ever-present and half-hidden around every corner – luckily the guide riding shotgun told us when and where to look. Put together in a cacophonous medley, the engine’s roar and Matt's voice over the speaker system gave the whole trip a raucous soundtrack. Like a man dressed in a banana suit, we were turning heads. We sailed past Horse Guards where sharply-dressed soldiers stood dead still while crowds of tourists clamoured round for photos. They didn’t know where to look when we appeared in our massive six-wheeled behemoth. We felt like royalty as we waved down at them. Next we flanked Trafalgar Square and the National Gallery before passing the Ritz Hotel, its façade draped in Union flags. It was here where an open-top tour bus followed behind us. I couldn’t help but think we had the better deal. 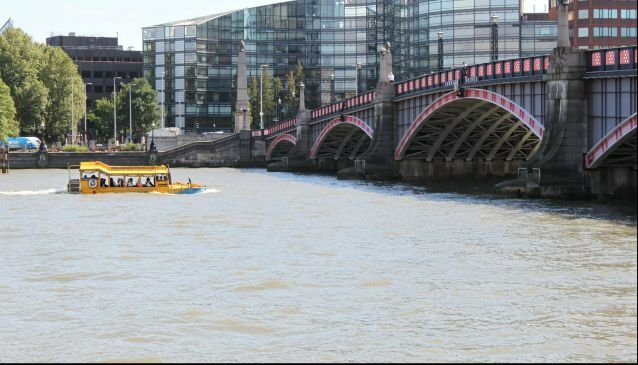 Buses in London are as common as rain during a UK summer; no one was paying them any attention, and they certainly weren’t going anywhere near the surface of the Thames (unless something went horribly wrong) like we were about to do. 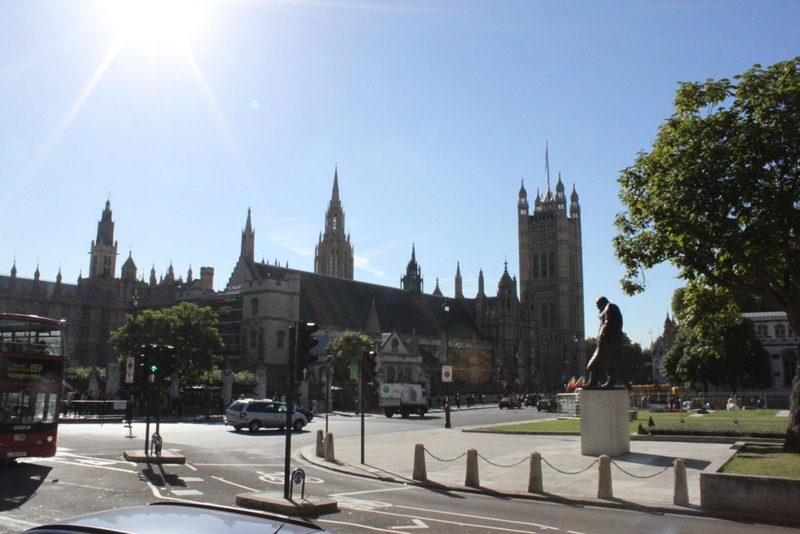 Our driver, Mark, skilfully navigated Hyde Park Corner’s infamously frenzied roundabout and we got another chance to see the incredible architecture of Westminster. 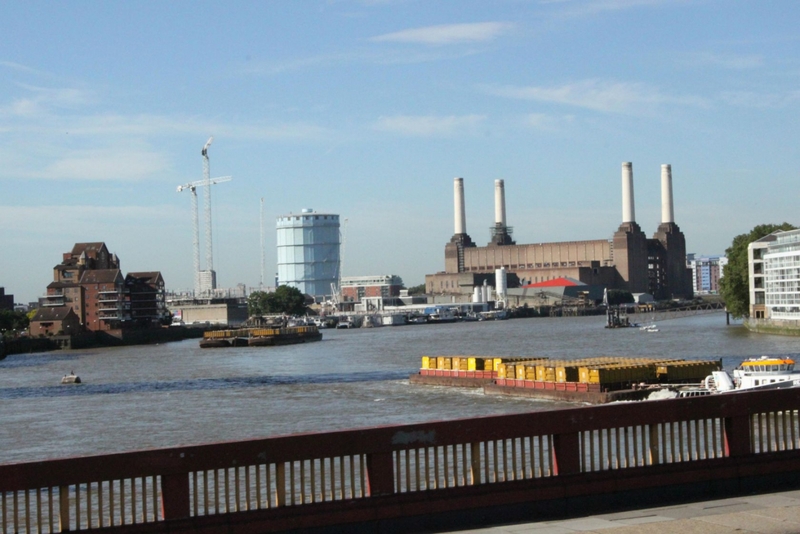 There was a passing glance of Buckingham Palace and, as we crossed Vauxhall Bridge, distant Battersea Power Station was a dead, concrete animal on its back with its four massive chimney stacks sticking up in the air. Another pool of tourists stopped and watched us roll past, waving as we went. As much as we were on the lookout for attractions in London, we too were being regarded as one, albeit on a much smaller scale. Finally, the time had come. We’d done the road bit, now the Thames awaited us. There was a brief pause when the drivers had to change over. Roadie, Mark, made way for waterman, Joe, and we were off into the sloshing brown murk of England’s famous river. I felt a twang of anxiety and nervous anticipation as the lumbering hunk of metal approached and engaged the sloping gangway. It was a bit like the start of a rollercoaster – the world’s most pathetic rollercoaster. But seconds later we were fully afloat and the noise of the engine became even more uproarious, drowning out the sound of Matt’s voice. Behind me water bubbled, frothed and burbled while ahead, views of the Houses of Parliament, Westminster Bridge, and, once again, the London Eye loomed. 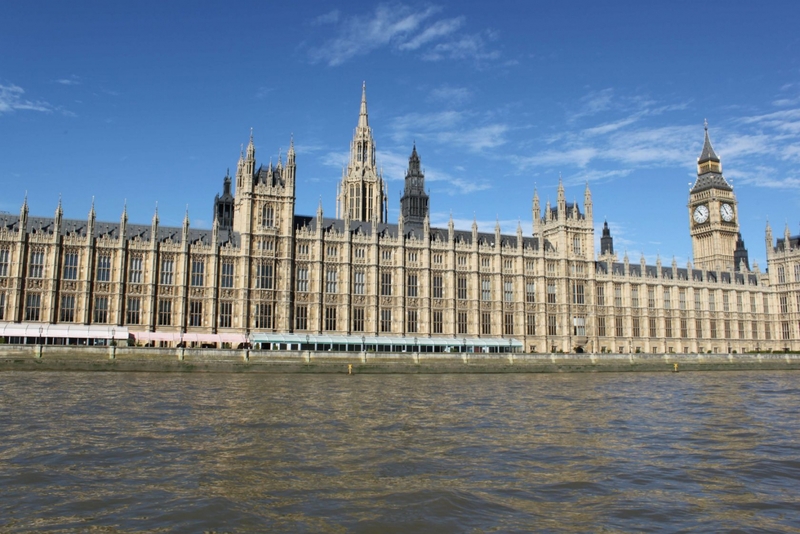 Interestingly, the Palace of Westminster received a very negative reaction when it was first built. People reacted much like they did to the disastrous 2012 Olympic logo. However, with its many needle-like towers soaring into azure skies, the parliament buildings looked as imposing and stare-inducingly impressive as always. Seeing this London icon is definitely best viewed from the river via amphibious war machine or otherwise. 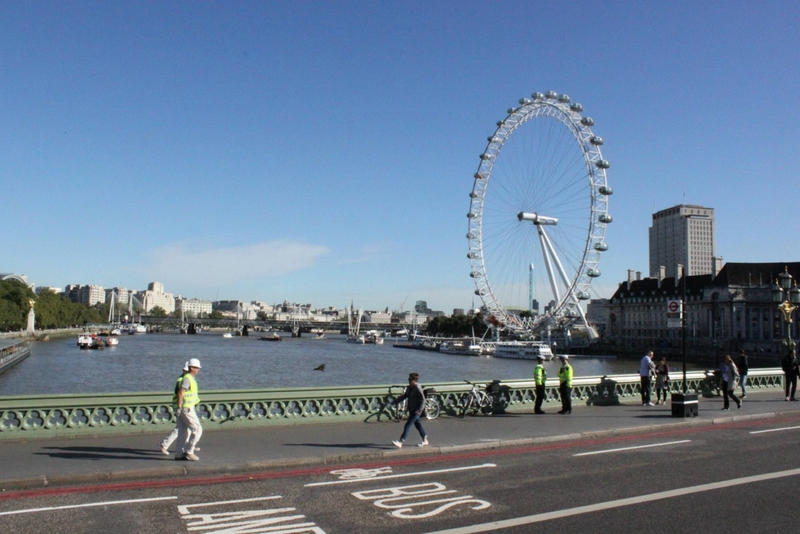 A quick U-turn before Westminster Bridge saw us backtracking to our river entry point. A police cruiser bobbed past us. Thoughts of it suddenly giving chase to a boat of reckless pirates went through my head. Sadly that didn't happen and we made it back onto dry-ish land where Mark was waiting to take the reins from Joe again. With liquid organisation and efficiency, the two guys were like figures popping out of a cuckoo clock. We headed back to the starting point, past all those pointing fingers, waving hands and wide eyes. My short time as a London celebrity was over. After an hour of fleeting recognitions and flashes of look-at-that’s, it was time to blend back into the foreground, become part of the everyone once again. Thanks, London Duck Tours, for drawing and taking attention to and away from the big guns of London’s highlights, if only for a brief spell.